Not surprisingly, all of our favourite winter pastimes revolve around Toronto Design Week. We love to mix and mingle with local and international talent, discover new products, and indulge our inner voyeurs at awesome exhibition and event spaces, otherwise hidden from view. What’s more, during the Toronto Design Offsite Festival (TO DO) and the Interior Design Show (IDS), our editors get to adorn the best stuff we see with our DL Loves tags. You’ll see them hanging in TO DO window installations and on newly minted products you’ll want to own after IDS. Follow the action on our homepage as we spread the love, one day at a time. We’ll also be sharing updates via our Instagram under the hashtag #DLLoves2018. Be sure to tag your posts so you too can share in the fun. Inside the hallucinatory installation at last year’s party. Photo by Rob Shostak. True to its name, the Toronto Design Offsite Festival likes to party in unusual places. This year, the celebration migrates from the Church of the Holy Trinity to Lightform’sshowroom and warehouse. Here, Jordan Söderberg Mills bends the laws of physics with the installation, ‘String Theory,’ while the experimental ‘Feelbot’ by Toronto based Equal Parts Studio adds emotional depth to your live tweets from the dance-positive event. Architect Joy Charbonneau posted shining examples of Canadian design to Instagram every day in 2017. The culmination of an ambitious year-long project, 365 Days presents images of Canadian design as curated by KPMB architect, artist and designer Joy Charbonneau. Her Instagram account, @marianadesigncanada, shows an awe-inspiring number of home furnishings, ceramics, textiles, objects, and illustrations made by our fave Canucks. We can’t think of a better way to orient yourself before you plunge into the festival’s full program of events. Mercury Bureau presents a range of compositional vases created with it-floral studio Flùr. Mercury Bureau joins forces with Flùr, leader of the indoor flora movement in Toronto, to create a collection of elegant vases fit for ikebana devotees. Take respite from the cold inside the shop’s resplendent interior by MSDS Studio (who stage an exciting intervention of their own at Aesop on Queen W) while enjoying some therapeutic greenery. Intricate detailing, like this gold-threaded bird, is a mainstay of traditional Japanese textiles. If you’ve been waiting for a social occasion at which to flaunt your kimono, this is your moment. Luxurious silk and gold textiles are presented alongside humble hand-dyed indigo cottons, representing a wide spectrum of textiles from 19th and 20th century Japan. Additionally, the festival invites Marta Turok to introduce the robozo, a rectangular shawl worn by women across Mexico, followed by an intimate gallery tour. The creative force, made up of OCAD U students, behind the interactive group exhibition. In 1870, Jules Verne predicted that electrically powered submarines would transport humans underwater. Now, a group of Black-identifying designers and makers are using speculative fiction to envision a better future for themselves and their communities. We’re excited to see prototypes alongside hacked technologies that engage ideas of food sovereignty, the maker revolution, and sustainability. Montreal’s Allstudio elevates office life beyond the ordinary with these planters/side tables. Don’t hit the snooze button on this sure-fire exhibition, which showcases contemporary products for the home and office from 10 Canadian designers and studios we love: Allstudio, Area 91, Dear Human, F&Y, Char Kennedy, Jacob Mailman, Mercury Bureau, MPGMB, Geof Ramsay, Stewart Shum and Ange-line Tetrault. The show is a great opportunity to peruse the Umbra collection, and at the bustling reception, meet other design lovers. Last year’s OCAD U expo offered fascinating design solutions to real-world problems. A showcase of prototypes and works-in-progress from students of the Industrial Design and Graphic Design programs at OCAD University, this is the place to get a leg up on the future of Canadian design. Identify tomorrow’s superstars while grappling with urgent questions to do with modern life. We’re still enraptured by Paolo Aguila’s balcony chicken coop from last year’s show. Dear Human‘s mottled contribution to the annual materials-focused exhibition. A conceptual exhibition with a tangible foundation, Matter asks us to consider the life-span of materials. View objects by 12 designers and artists that tread the line between product and sculpture, made from materials such as wood, ash and Styrofoam. We’re intrigued by James Michael Shaw‘s recycled plastic candle holder, which resembles a mound of melted soft-serve ice cream. Spanish designer Jaime Hayon poses in front of his Ceasarstone creation at last year’s show. Photo by Liah Chesnokov. IDS attracts an impressive roster of bigwigs each year. To name-drop a few: Karim Rashid, Jay Osgerby and Snarkitecture, who collaborate with Ceasarstone on a range of kitchen islands. Other guests include celebrity interior designers Kathryn Ireland and Desta Ostapyk, who you may recognize from the Bravo TV shows Million Dollar Decorators and Love It or List It, respectively. We’re hoping Jonathan Friedman of Partisans, the architecture firm featured in our current This Creative Cityissue, will autograph copies of our mag onsite. 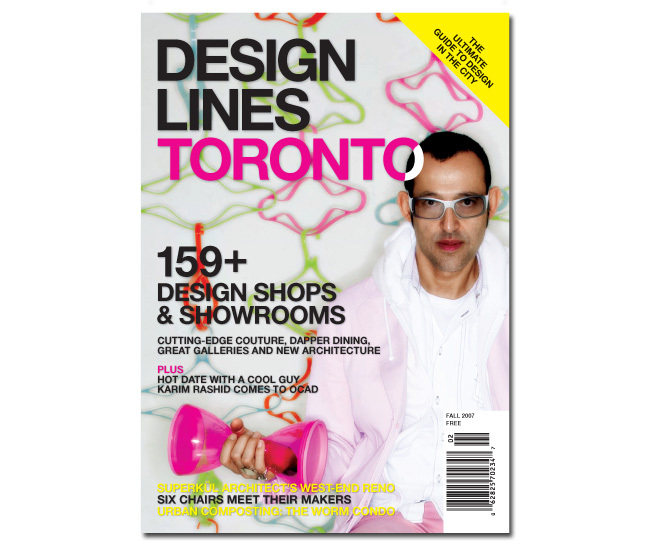 Dresscode: Karim Rashid’s 2007 Designlines cover look. Kaitlyn Bourden created this tangled installation for last year’s hotel intervention. When breathtaking art installations and a magical party come together, you get CUTMR, one of TO DO’s best-loved events. The historic Gladstone is barely recognizable after a host of artists takeover four floors of the hotel. Best of all: the artsy backdrops stay up all night at the TO DO Love Design Party, which closes the festival. Aberrant Architecture brings their fire-engine red Tiny Travelling Theatre to Toronto. Harbourfront Centre hosts a group exhibition by TO DO’s inaugural international guest of honour, Aberrant Architecture, and a coterie of North American studios from Winnipeg to St. Paul, Minnesota, who all present interactive works that highlight community and locality. Learn about Abberant’s Tiny Travelling Theatre, a public performance apparatus on wheels. Jeneca Klausen of Saint John, NB shows her (pendant) face at the travelling exhibit dedicated to North American design. Unpacking this showcase is a delight for our editors. Objects that reflect the resources and inspirations of designers living across North America are shipped in Bankers boxes across the continent. Their Toronto Offsite Design Festival stop, at the Harbourfront Centre, forms a perfect complement to the show In Place (#12 on this list). Share your impressions of both exhibits with the hashtag #DLLoves2018. This fiesta-ready installation celebrates the festival’s arrival at Yonge & St Claire. What better way to end the Toronto Design Offsite Festival than to visit, and help dismantle, a towering deer piñata? The party favour looms large in a slick lobby at Yonge and St. Claire, paying tribute to the former inhabitants of Deer Park across the street. We love the community focus that architecture firm Gensler brings to the project.